Why stay in a costly hotel when you can enjoy the comfort of this inexpensive one bedroom/one bath condo in sunny Kihei? 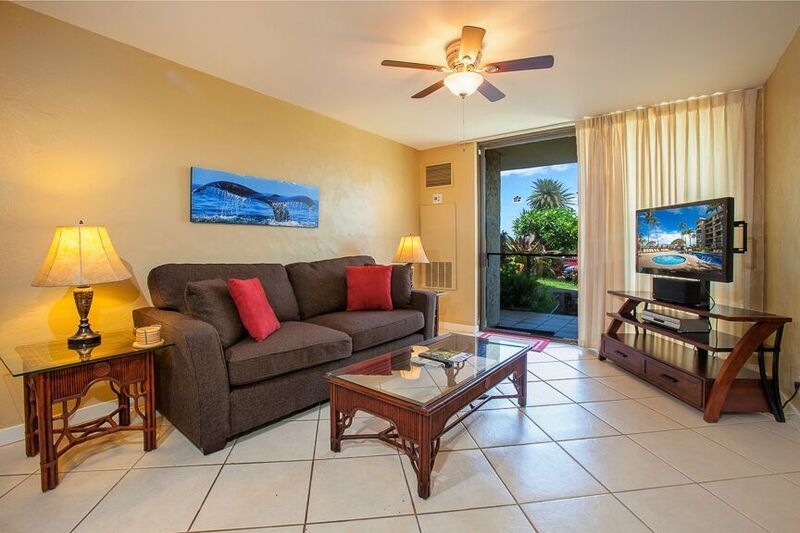 This remodeled condo in the Kauhale Makai (Village By The Sea)Complex sleeps 2 and has a fully stocked kitchen. Upgrades include ceramic tile flooring, custom color paint and custom tile/glass block shower. The Unit (#108) has one free assigned parking spot just steps outside the lanai. You don't have to carry all of your heavy luggage and beach equipment up the stairs!! All linens are provided as well as beach towels. For those hot days and nights, you have CENTRAL air-conditioning to cool you down! Flat screen TV (39') and FREE WIFI IS ALSO AVAILABLE. The bedroom has a comfortable mattress and the queen size sofa bed has an upgraded mattress. If your accommodation requirements are direct ocean and sunset views, upper level location, and a large gourmet kitchen- then this is not the condo for you. There are many other condos with high-end amenities priced MUCH higher per night. Our philosophy is simple..... we offer low-cost, clean and comfortable accommodations. Why spend lots of money on a condo rental when you spend such little time inside? This is the beautiful Island of Maui! Spend your time and money exploring all the sights and adventures that Maui has to offer! The Kauhale Makai complex offers a fully staffed front desk, pool, jacuzzi, sauna, gas BBQ grills, shuffle board, volley ball and horseshoe pit. Love all things Hawaii! Purchased this little piece of paradise in 2003. I take pride in keeping the condo in good condition and providing a fully stocked condo for a memorable Maui vacation! Our philosophy is simple..... we offer low-cost, clean and comfortable accommodations. Why spend lots of money on a condo rental when you spend such little time inside? This is the beautiful Island of Maui! Spend your time and money exploring all the sights and adventures that Maui has to offer! Central Air Conditioning (many condos on Maui have inefficient window air conditioners that do not cool the condo as effectively as Central A/C)! Assigned parking spot- no need to search for an available parking spot after a long day at the beach. This condo comes with one assigned parking spot just steps from the lanai. No need to carry all your luggage and beach chairs/equipment up the stairs or an elevator. Close to stores, restaurants, coffee shops, pharmacy and grocery stores! On site office staffed from 9am-5pm including an activities concierge to help plan all of your Maui adventures. Shower and Toilet are separate from Sink/Vanity making the bathroom more functional (one person can use shower or toilet while the other person can use sink). Shower is all custom decorative tile with one wall of glass block. Plenty of room in vanity for your personal care items. CENTRAL A/C!! (NOT a window unit!). Full sized pool with additional shallow 'kiddie' pool. Aloha! Thanks so much for your kind review. Would love to have you back again. The room was located on 1st floor which made it easy getting in and out. Beach in front of condo was good for watching whales and sunsets. Currently doing road work in area so plan around work. They seemed to stop at 3:30 each day. Short distance to shops and sandy beaches. Kind of wished TV was in Bedroom as we like to watch some TV before bed. Construction continues on condo, but is on southern building with no impact on room. BBQ and pool were great areas for meeting others visiting island. Worth the cost, thank you for letting us use your condo. Aloha Gary- thanks for being my guest! And thanks for the great review. Please come back soon! Awesome value! As usual Mike is always great to deal with! See you again in 2020! Fantastic holiday once again! Only complaint is it ended to soon! Mahalo Tira! Always enjoy having you and Mark as guests. Thanks for the kind review. Aloha until next year! I have been coming to Maui for many years and this was my third time staying in Mike’s condo. I really enjoy the area and the close proximity to everything you will need to help make your stay great! The condo has a new coffee maker, fridge and dishwasher that I enjoyed very much. My stay includes the Christmas Holidays as my daughter joins me and we have everything here to make it a very Merry Christmas 🎄�. Mike is great and always prompt to deal with any concerns I may have. I am booked to return again!! Thank you Barbara! I am always happy to have you as a renter. Looking forward to having you as a guest again next year. Aloha! Clean. Good parking. Quiet beach. Beautiful sunsets. Perfect amount of space. We really enjoyed our stay here. The apartment had everything we needed. The pool and hot tub in the complex are great. The unit stays nice and cool, we didn’t even need to use the aircon. We would stay again! Aloha Hannah and MAHALO for the 5-star review! So happy to hear you enjoyed my condo and your Maui vacation. I would love to have you as a guest in the future! $100 Booking/Security Deposit Required. Deposit returned within 30 days after stay. Discounts Given for Stays of 28 Days or more Additional cleaning fee may apply for parties of 3 or more Stays LESS THAN 7 nights (especially high season) may not be accommodated (PLEASE ASK OWNER) Note: Until confirmed, rates are subject to change without notice. YOU ARE STRONGLY ENCOURAGED TO PURCHASE VACATION RENTAL CANCELLATION PROTECTION (available through VRBO/HomeAway- see below) OR ANY OTHER TRAVEL INSURANCE WHICH REIMBURSES YOU DUE TO CANCELLATION LESS THAN 60 DAYS OF ARRIVAL.